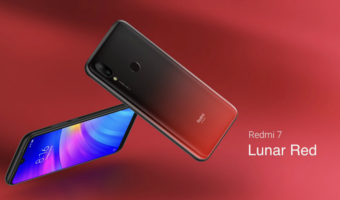 Early last month Chief Minister of Maharashtra, Devendra Fadnavis announced an ambitious program to deploy India’s largest free public wifi network in the metropolitan city of Mumbai which is also the state capital. 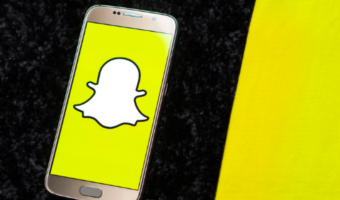 On the 6th January, around 500 public hotspots went live, and the chief minister promised that the number would steadily increase to reach 1200 by 1st May 2017. These hotspots do not have any time based or data volume based usage limitations. I decided to get some first-hand experience of the free wifi service on the streets of South Mumbai, which happens to be where I reside in the city. The above image shows a poster of ‘Aaple Sarkar’ which is the name of the public wifi network, such signs have been put up at regular intervals along the streets on the CCTV camera poles which serve the dual function of surveillance as well as doubling as wifi hotspots. Connecting to the network is a fairly straightforward process where one just has to check for available wifi networks and select the one with SSID Aaple_Sarkar_Mum-Wifi and then he will be presented with a login page where he has to enter his mobile number and submit, following which he will receive an OTP via SMS which he enters in the following screen along with his name and clicks on submit. 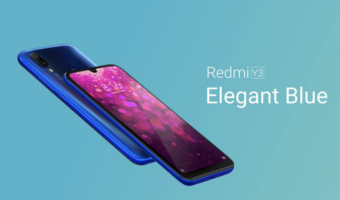 The network then connects by assigning an IP address to your phone, and every subsequent time that you connect, you just need to enter your number and connect without having to go through OTP verification step so long as the same number is entered on the same handset. 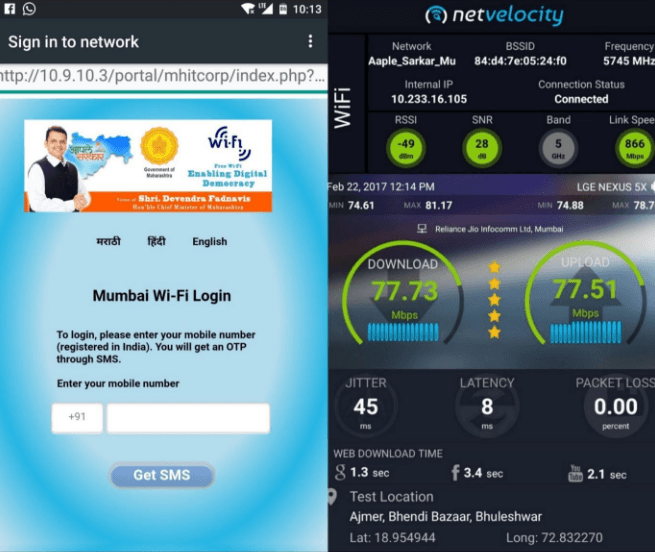 Above is an image of the login screen of Aaple Sarkar wifi on the left and the speed test result conducted on my Nexus 5X mobile using Jio’s NetVelocity app with Reliance Jio’s server used for the test. The network connected on the 5GHz band which gives better performance than the 2.4 GHz band, also the latency was just 8ms which are pretty good. The download speed I got was above 77 Mbps, and upload was above 77 Mbps as well. Pretty impressive performance for a free public wifi network, though it seems to be underutilised at the moment. 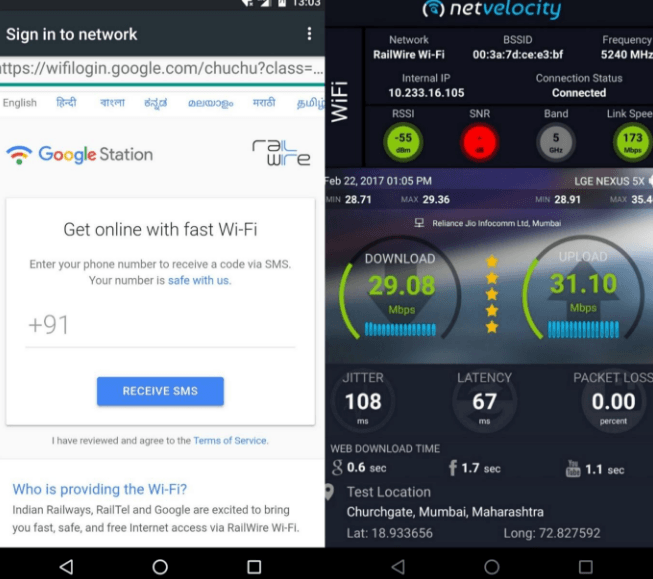 In comparison, I also tested the performance of another free public wifi service called Railwire which is a joint venture between Google and RailTel offering free wifi connectivity at Mumbai suburban railway stations. The above image shows a similar OTP based registration page of Railwire and the speed test result for the network test I conducted at Churchgate station in South Mumbai using my Nexus 5X with the NetVelocity app. Even this network connected on the 5GHz band though the latency and jitter was considerably higher than Aaple Sarkar. The download speed was above 29 Mbps, and upload speed was above 31 Mbps which is also pretty impressive considering that there are way more users connected to the network compared to Aaple Sarkar. One downside of Railwire is that you will need to perform the SMS based OTP verification every time you connect to the network on every station. Railwire free wifi is currently live at Chhatrapati Shivaji Terminus, Churchgate, Bombay Central, Dadar, Khar Road, Bandra suburban, Bandra terminus, Lokmaya Tilak Terminus, Kalyan stations and is spreading to more stations steadily. 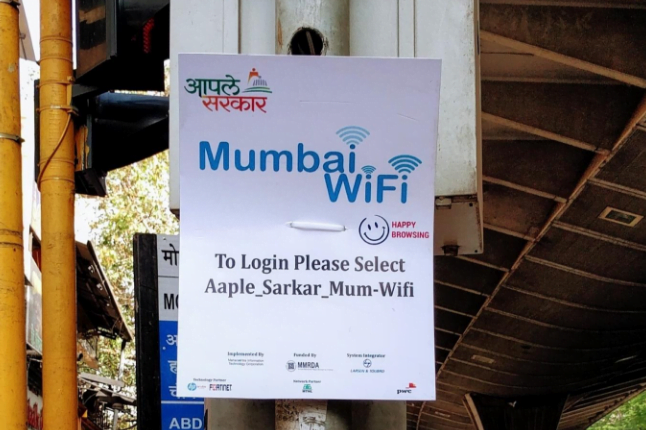 Aaple Sarkar free wifi is live at Seepz, Bandra, Goregaon bus depots, Bhandup, Govandi, Mankhurd, Chembur stations, Marine Drive, Regal, Kala Ghoda, Fashion-street, Metro Junction, Mohammed Ali Road in South Mumbai, just to name a few prominent locations. I don’t usually advocate data caps, but the government should cap data as the usage grows. The point of free public Wi-Fi should be to ensure the public has access to basic internet services anywhere in the city. It is important to prevent a handful of heavy internet users from clogging up the network. You can imagine what will happen when this rolls out to residential areas. People will stop using their personal connection, and place all the burden on the public network.